West's career served as a model for many American painters of his day who aspired to go beyond portraiture to depict loftier themes from history and religion. Growing up in modest circumstances in Philadelphia, West became, in 1759, one of the first American artists to study abroad, and within four years he had settled permanently in London. Despite increasing tensions between Britain and the colonies, the tactful and talented young American was appointed history painter to the king in 1772. Pharoah and His Host Lost in the Red Sea is an unfinished study that West conceived as part of an ambitious cycle depicting "Revealed Religion" for the private chapel of George III at Windsor Castle. 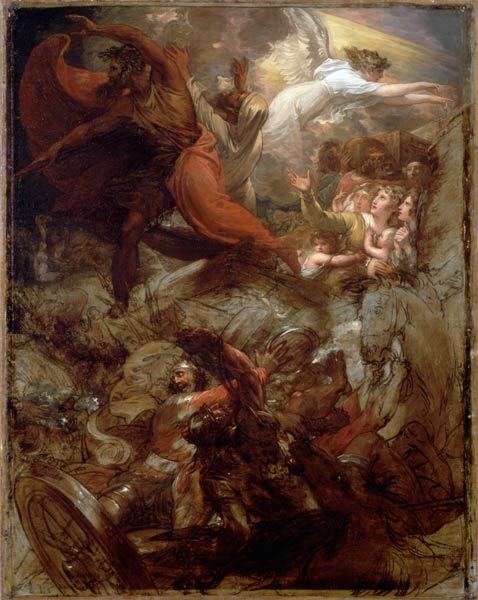 The sense of drama and terror of this episode from the Old Testament is heightened by the metaphoric use of light and darkness, the emotionally charged figures, and the swirling, chaotic composition. In the upper left the powerful Moses extends his rod against the Egyptians, whose pharaoh is engulfed below by the Red Sea. The idealized figures of the reprieved Israelites are embraced by divine light and the protection of the angel of God.